Why visit Electric & Hybrid Marine World Expo? Electric & Hybrid Marine World Expo is exclusively for people involved in the decision-making process in specifying which propulsion systems to invest in, which components to procure or which charging infrastructure to specify. 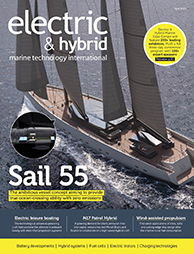 Electric & Hybrid Marine World Expo is organised by the publisher of Electric & Hybrid Marine Technology International, the world’s only publication dedicated to these emerging electric and hybrid marine technologies. This world expo will bring the pages of the magazine to life. Entrance to Electric & Hybrid Marine World Expo is free to qualified industry professionals only. Electric & Hybrid Marine World Expo is organised by UKi Media & Events, the world’s premier international trade show organiser and magazine publisher operating in the maritime, aviation, automotive and transportation sectors. It is an international organiser of almost 30 industry-leading exhibitions, working globally in Hong Kong, Detroit, Los Angeles, Brussels, Stuttgart, Paris, Geneva and Brasilia, and attracts over 3,000 exhibiting companies and over 50,000 visitors to its events every year.